Hong Kong director Wong Kar-wai's latest film, The Grandmasters, recently released a second trailer - 18 months after filming started and 10 years after the director conceived the movie. 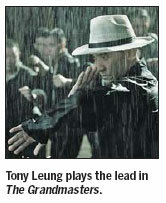 The one-minute trailer, set on a street, on a dark, rainy night, depicts a battle between lead actor Tony Leung and about 20 kungfu artists. In a black gown and white hat, Leung transforms his signature gentlemanly manners to kick and punch like a street fighter. The scene is a nod to Keanu Reeves in The Matrix and Christian Bale in The Dark Knight. The film's first trailer, released in December 2010, is just a play of light, shadow and Chinese calligraphy, without any actors. Leung plays the late kungfu master Ip Man, known for his wing chun style, a form of Chinese martial arts. Leung, the Lust, Caution and In the Mood for Love star, practiced wing chun for about two years. A disciple of Ip trained him and even adjusted his diet. Ip has been a favored topic of the Chinese film industry in recent years. There have been at least three films about the legendary martial artist, whose students included Bruce Lee. The most popular incarnation of the martial arts legend is by Donnie Yen, star of Iron Monkey and The New Dragon Gate Inn. In two Ip biopics, Yen portrays the kungfu master as a loving husband and passionate patriot. Wong's film will not focus just on Ip, but a group of kungfu masters of his time. He has put together a stellar cast, including Zhang Ziyi, South Korean star Song Hye-kyo, comedian Zhao Benshan and his protg Xiao Shenyang. Though kungfu fans have been looking forward to the release of the film for some time, Wong has prolonged shooting, as he often does. Leung even took a break to take the lead in another movie, The Great Magician, which will be released in December. Sil-Metropole Organization, the film's production company, says filming has been completed and the director is working on post-production. But a release date has still not been given.